Scientists at Wake Forest Institute for Regenerative Medicine (WFIRM) in North Carolina have used 3D printing to develop a “body-on-a-chip” drug testing system. The system consists of micro “organoid” versions of the heart, lung, and liver. When pharmaceutical companies develop new medications, they face a 90 per cent failure rate. It sounds disheartening, but it’s really just part of the process for discovering what works and what doesn’t. That high rate of failure, however, comes at a cost. That’s because determining whether a new drug fails or succeeds requires a whole lot of investment—in the development of the pharmaceutical product in the first place, but also in the extensive testing equipment and live animal subjects needed to see how the drug performs. The concept of the “body on a chip” could change all that. Scientists using advanced 3D bioprinting equipment are now able to fabricate human tissue made from real human stem cells. This means they can create scaled-down replicas of certain bodily organs that react in similar ways to their organic counterparts. For Anthony Atala, M.D., director of WFIRM and senior researcher on a multi-institution “body on a chip” project, this progress has come not a day too soon. “There is an urgent need for improved systems to accurately predict the effects of drugs, chemicals, and biological agents on the human body,” he said, noting the cost and relative lack of accuracy involved in animal testing. By creating a set of tiny 3D printed organs, or “organoids,” the WFIRM researchers have been able to develop a comprehensive platform for drug testing, allowing them to see how human organs react to drugs. They say it’s much more precise than cell screening and animal testing. 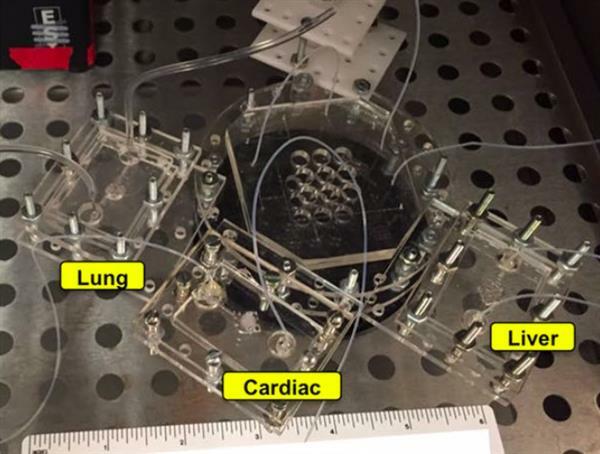 The system consists of a bioprinted heart and liver, with these organs being particularly vulnerable to the toxic effects of drugs. There are also miniature lungs in there to represent the point of entry for toxic particles and aerosol drugs like asthma inhalers. The body on a chip is then monitored with a real-time camera, while a nutrient-filled liquid circulates through the system to keep the organoids alive. This liquid also functions as the means of injecting drugs into the system.